The BoM recently increased its ENSO Outlook status to El Niño ALERT which means there is a 70 per cent chance of an El Niño forming. The forecast for the Indian Ocean Dipole is to remain neutral through Autumn. Historically, April has been the time for climate drivers, like the El Niño Southern Oscillation and the Indian Ocean Dipole, to reset for the coming season, creating uncertainty and reducing the skill of models at this time of year. 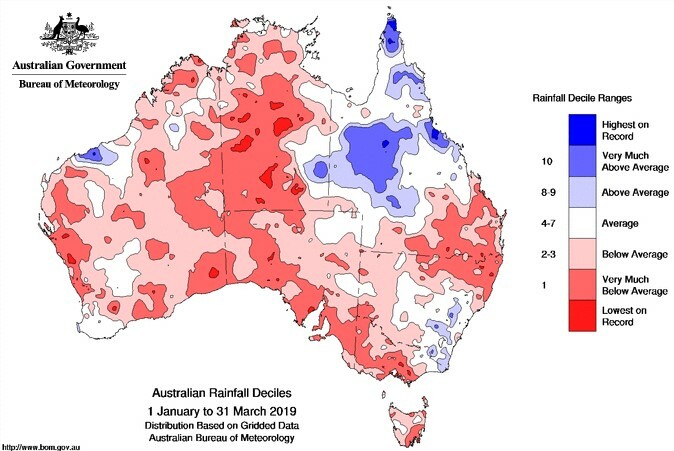 March saw most of Queensland, parts of Eastern New South Wales and some locations across Western Australia receive ‘Average’ to ‘Above Average’ rainfall for the month, and improvement on the very dry conditions experienced in February. However, there are areas, across the centre of Australia, the larger part of Victoria and much of South Australia that are still experiencing Below ‘Average’, ‘Very Much Below Average’ and ‘Lowest on Record Conditions’. Figure 1. Rainfall deciles for March 2019. 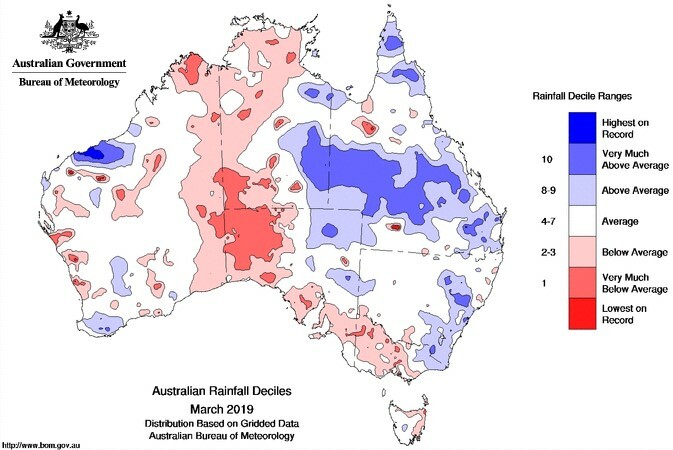 Significant rainfalls across these areas in March increased the overall three-month decile, demonstrating the challenge that forecasters face at this time of year and highlighting the care that needs to be taken when making decisions based on seasonal averages. Figure 2. Rainfall deciles for January to March 2019. The BoM’s ACCESS model provides little indication of rainfall in the April to June outlook period. Figure 3. does indicate a slight trend towards greater chances of above average or below average conditions for the Far North and southern Western Australia, but it should be noted that many climate models at this time traditionally have lower skill as the climate drivers reset for the coming season. The ACCESS model has generally moderate skill over Australia for this time. Figure 3. 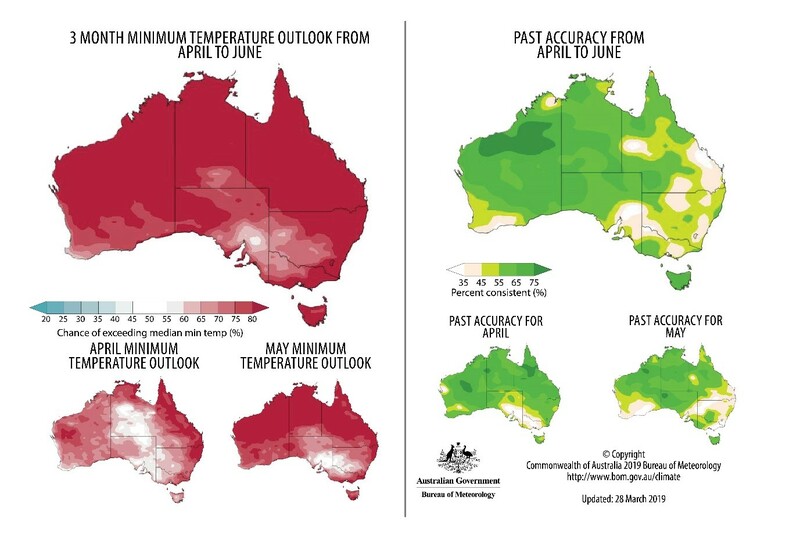 Australian outlook for April to June 2019. Maximum temperatures were ‘Average’ to Highest-on-Record’ across most of Australia, except for a sliver of the southern coast of Western Australia around Albany. While minimum temperatures were ‘Average’ to ‘Highest on Record’ for the whole nation. Figure 4. 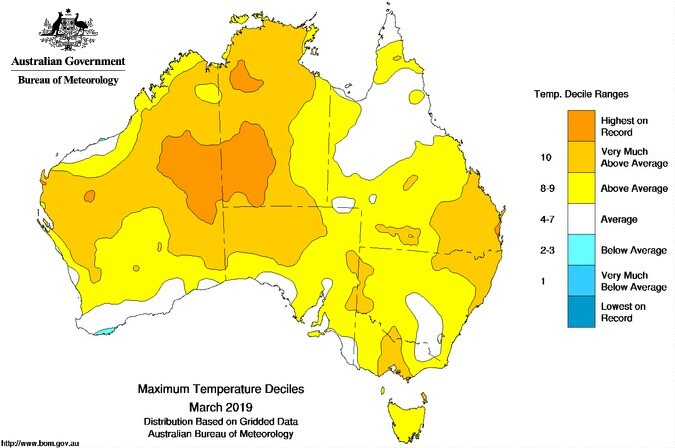 Maximum temperature deciles for March 2019. Figure 5. 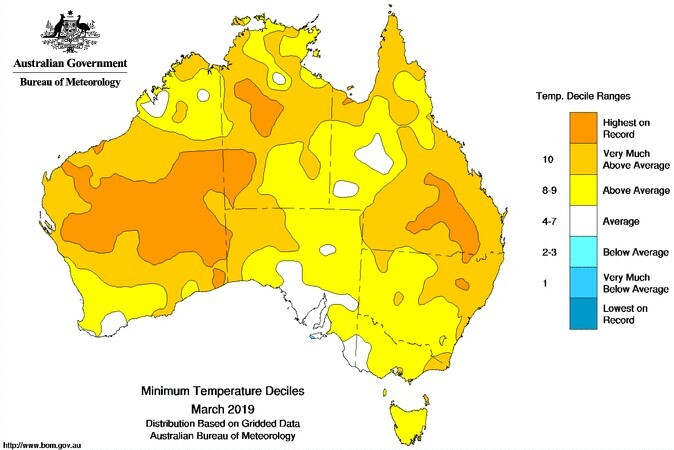 Minimum temperature deciles for March 2019. 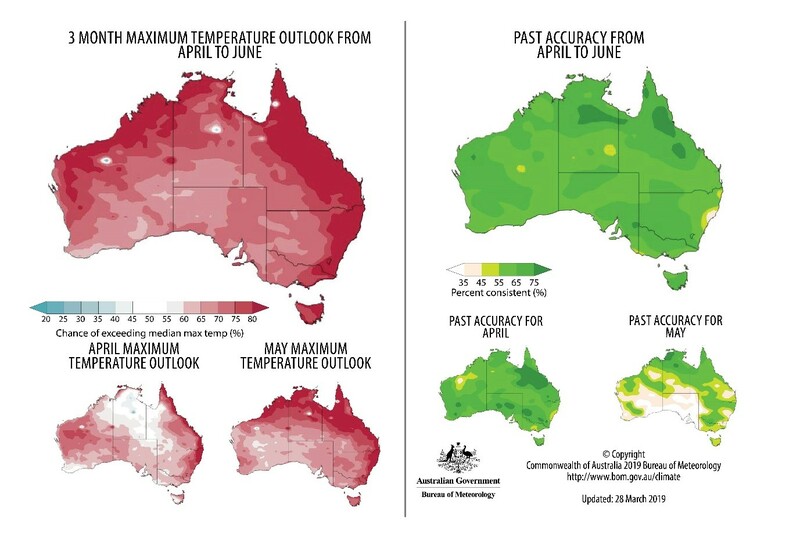 The BoM’s ACCESS model forecasts suggest ‘Above Average’ maximum temperatures across the whole of the country over the next three months. Historical data shows that the ACCESS model has a high level of skill at this time of year, although this decreases, particularly across south central and south west, from May onwards. Figure 6. April to June maximum temperature outlook. Minimum temperatures are also forecast to be average to above average over the next three months. Again, the ACCESS model has a high level of skill at this time of year, which continues through to May. Figure 7. April to June minimum temperature outlook. The Bureau of Meteorology has great resources for learning more about climate. If you're looking for a forecast for your specific region or sector, you can find direct links here! During La Niña years, drives higher winter and spring rain across Australia. During El Niño, herds the rain away. Herds moistures from the warm north-east Indian Ocean across Australia to influences spring rainfall. Blocks rain-bearing fronts in summer over southern Australia. Less active in winter, allowing winter rains through. Herds cold fronts up from the Southern Ocean, which can bring rain to southern Australia. Can bring strong winds and heavy rains to the east coast, mainly in Autumn and Winter.